It all started at Redondo Beach. Famed for its fresh seafood and beautiful coastline, Redondo Beach is one of the top tourist destinations in the Greater Los Angeles area. Personally, I don’t care much about the beach and the touristy crowd; the main draw for me is the live-in-the-tank (hidup!) and wide selection of fruits de la mer…and so, that was the beginning of my shellfish binge this past weekend. 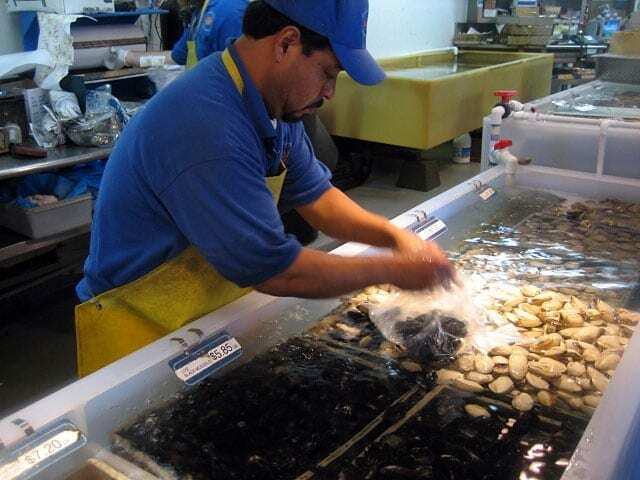 As a die-hard seafood aficionado, Quality Seafood is a dream come through. Think 25 varieties of fresh oysters, over a dozen of clams of various sizes and species, lobsters from both the Atlantic and Pacific waters, and big fat meaty crab of all kinds (has anyone tried Spider Crab before?!). And wait, there are more: fish, chilled seafood, cold appetizers, hot seafood dishes, cook-to-order services, plus a few tables right outside the shop to feed the eager seafood buffs who just can’t wait to get home to devour their goods…well, you get the idea. This is a seafood lover’s paradise. Period. So, at the sight of the above large shellfish selection, I literally went hog wild with my buying (and later eating) spree. 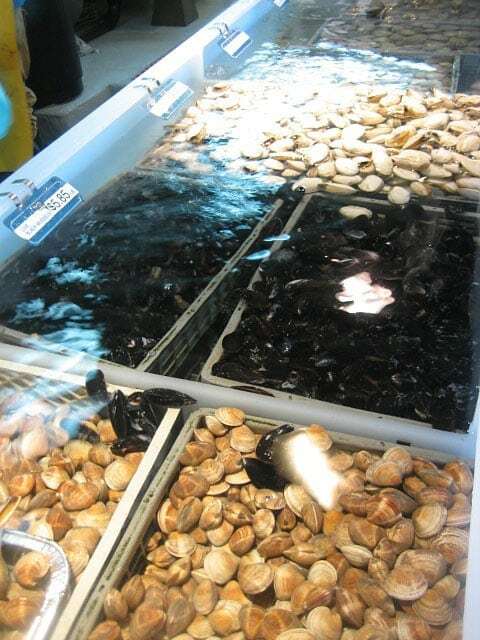 I got myself black mussels, farmed necks, live softshells, and scallops. On the way out, I scooped up a dozen of fresh oysters–Kumamoto, Stellar Bay, Eastern, Baja, Willapa, and Malpeque–and had them shucked and served immediately. The Stellar Bay and the Malpeque, both recommended by the salesperson, were sweet, creamy, and very tender. 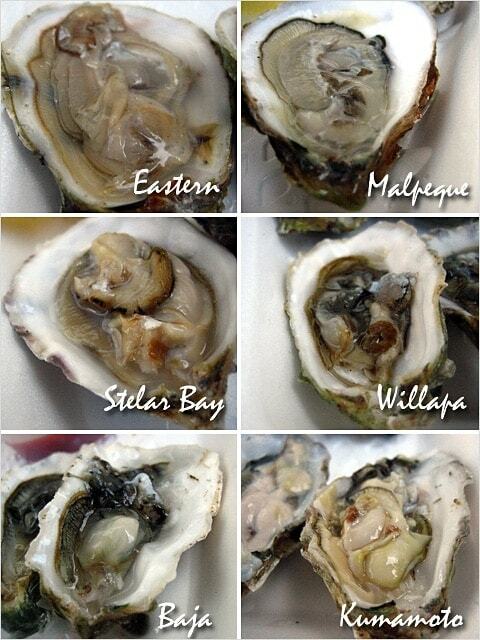 The Willapa tasted salty to me and the Kumamoto were mushy. I enjoyed the Baja oysters while LK preferred the Eastern oysters. 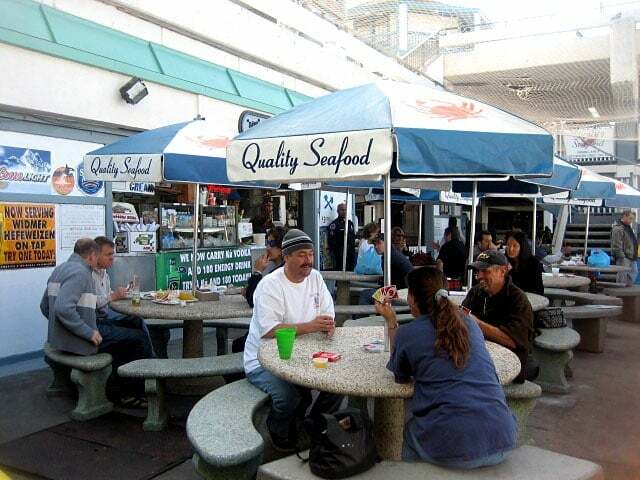 All in all though, Quality Seafood–as the name suggested–is a great fish market. The price is not cheap (raw oysters are priced at $1.25 – $1.85 each), but you get what you pay for, that is, freshness and varieties. Now, do you like raw oysters on the half shell? Wah, so many names.. I better stick to ‘lala’ then. I don’t know there are so many different kinds of oysters…I guess in Malaysia, we don’t get the different kinds. It’s interesting to see the pictures side-by-side as they all look different shape, color and size. Ooo… they all look so so so fresh! Being there must be a super experience! Looking at all the fresh ingredients, and in your mind thinking of all the dishes you can whip up. Hey, where the Califonian white wines to dessert the whole seafest ? Make sure Overload 3 ok ! Hi BY! I’ve got 1 more party to go and should be back on schedule on my postings. Pls do me a favour next year…. remind me to stick to only 2 parties or home entertaining dinners …. I think I over did it again. Gettin old aredi lah! I need a personal favor. Do you mind e-mailing me at [email protected]? Thanks a bunch! You have tickled my tastebuds again. I absolutely love fresh oysters with a splash of lemon juice…..salivating as I type this. I can easily have 18 in one seating. $1.85 each is disgustingly cheap. Ai-leen – yep…that’s the only way to find out what you like…to eat them side-by-side and compare the taste. Simcooks – of course I wouldn’t remember. I asked the salesperson to write down the name on the styrofoam plate and then I took pictures. Keropok Man – The buffet oysters are usually very geli ones…they are huge and not supposed to be eaten raw…and not that fresh. Yes, Tambun, I am so going there when I go home for Chinese New Year! Audrey – cool, can’t wait to see what you are going to whip up next! Hakkahouse – you can find my email address on my profile. Mmm..Yummy. The shop reminds me of the seafood restaurant we have in town, where you select the seafood you want and they cook it for you in whatever style you like. Hey! My mom’s fast food restaurant is at Redondo Pier. 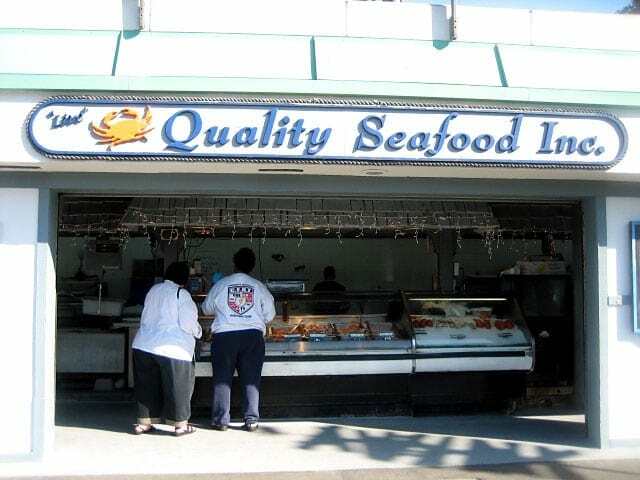 I know exactly where Quality Seafood is. We usually get the steamed crabs there. Very yummy.